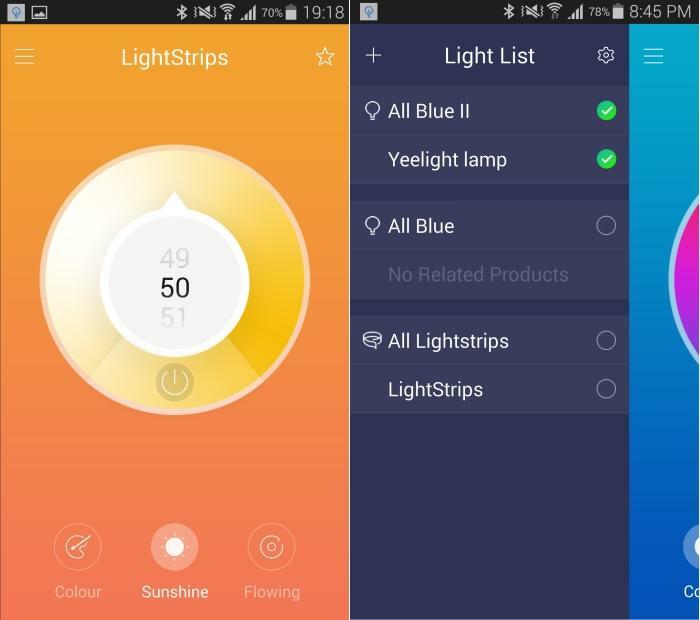 The Yeelight LightStrip works via Bluetooth, which means it's quite simple to use, and you can access it from any Android or iOS device on which you have its app installed. There is no major configuration process required except to pair the lightstrip to the app, and you just have to ensure that Bluetooth is enabled on your phone before you start it up -- otherwise the app will tell you to enable it anyway. The lightstrip houses a series of multi-coloured LEDs and its end plugs into a standard power outlet. It will work beautifully anywhere you have a lip under which the strip can be stuck, as it can then emit its light outwards in a nice glow. It's not something that you would want to mount in full visibility on a ceiling or against a wall due to the brightness of the uncovered light. We found it to be a great product to use on the back of a TV screen as an ambient light. 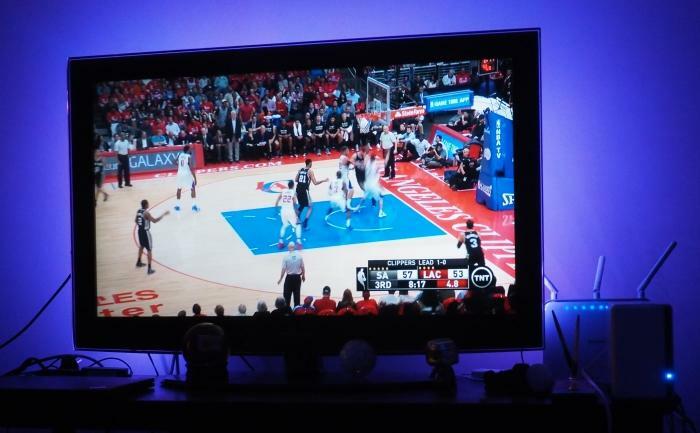 It worked well to set the scene for what we were watching, and came in particularly useful during sports events, where we could do fun things such as switch the light's colour to match that of our favourite team. However, while the light is easy to use and fun to implement in your home, its colour output isn't always accurate, and it can be a bit tough to get the colour that you're after all the time. For example, looking for a red colour was difficult in some instances. As we moved the circle in the app, the colour went from pink to purple, but seemed to bypass the red that we were after. It took a lot of playing around with the intensity and placement of the colour wheel to get it right where we wanted it. The hue control isn't as good as what we've seen from other colourful LEDs, such as the LIFX and Philips Hue offerings, though they are more expensive products. You can select from different colours, or from whites and 'sunshine' colours, and there is a 'flow' mode that can change colours automatically. It seemed to be necessary for us to select and connect to the light every time we launched the app, which was a little inconvenient, but we got used to it eventually. We could switch the light off from the controls it placed in the pull-down notifications of our Android phone. We did experience some crashes during our tests, but for the most part it was okay. Pairings from different phones often caused issues; only one device at a time can control the lights. As for brightness, the LightStrip has an output of 14 Watts, and there is potential to light up one part of a room quite well. It has a length of 2m for its LEDs and power lead, though cuts can be made if shorter distance is required. There is double-sided 3M adhesive in the package so that you can permanently place the strip in your desired location, otherwise you will have to fashion your own fixing if you don't want the strip to be a permanent feature. You will also have to make sure that your placement of the strip is within cooee of a power outlet, of course, and we recommend some temporary taping first to see whether your placement is what you want, before going all-in and fixing it in place. You can't place them in areas where they might be in danger of splashes from water, and they should only be used indoors or in well sheltered areas. Pick up the Yeelight LightStrip from Yeelight's site if you want a simple lightstrip that can be used to add a bit of colourful ambience to your rooms. It works especially well under countertops or when placed behind TVs. The direct connection via Bluetooth makes it easy to control; you won't have to place the LightStrip in an area within range of a wireless network because of that, nor will you have to install a separate bridge for the lights to communicate with your network. The biggest issue will be finding a close enough power outlet that's free. 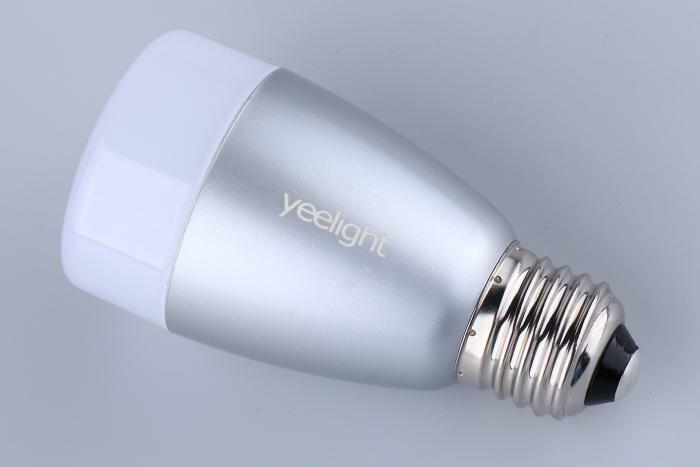 Within the app, you can access other Yeelight products that you have in your environment, including the Yeelight Blue II Smart LED bulb. We also had a look at that bulb during our test of the LIghtStrip. It's a multi-colour LED bulb with a rating of 6 Watts and a price of $59. It's not as powerful nor as expensive as LIFX and Philips Hue products, and its output isn't as bright, but it can make for a nice addition to a small corner lamp in a bedroom, for example. Again, the colour selection isn't as precise as the more expensive products we've seen, so you have to play around with the wheel in the app carefully to get the ambience that you're after. Rather than matching output from the Lightstrip and Blue bulb in the same environment, we often used slightly different colours to produce a more vibrant vibe. It's available in Edison screw or bayonet types, and its standby power is 0.3W. Both the LightStrip and the Blue II Smart LED bulb are good options if you want a simple way to add some custom coloured lights to your living area, especially since they are competitively priced.